Everybody loves the mystics. I think it’s because the mystics can get away with saying things that others can’t. I feel like I should be more into the mystics, but so far I haven’t been. Actually, I think maybe now that I’ve been studying the (not-quite-so-mystic) Church fathers for a while, I might be feeling ready to start seriously reading the mystics. In fact, I think too many people jump into the mystics too soon. It’s kind of like, “don’t try this at home” theology. Like those car commercials that say, “professional driver – closed course,” as if to absolve themselves of guilt if you try to drive like that. It seems to me that the books of the mystics should have some kind of disclaimer on them. “Before you read this… make sure you understand the basics.” In fact, I think it would be cool if my own books, like Trinity 101, or Reading the Early Church Fathers, were the prerequisites for reading the mystics. Not that I’ve mastered anything, really, but having written those books, I’m starting to consider myself ready to read the mystics. So far, my main connection to mysticism is not through mystical writings, but through music. Specifically, the music of Hildegard of Bingen. St. Hildegard was the Abbess of a convent in the 12th century. She was a mystic, and an author at a time when women didn’t get to write much, and she was also an inspired composer of some very beautiful music. In this week’s blog, I’m recommending that you check out her music. For the purists, a good starter CD is Canticles of Ecstasy. But you also need to know about the very creative arrangements of a guy named Richard Souther. He has made these amazing recordings of Hildegard’s music, and then added modern instruments. Kind of like, what if Hildegard and Enya lived in the same convent and had a recording studio. Actually, the Enya reference doesn’t do it justice. I like Enya, but if you don’t, please don’t let that stop you from checking this music out. The best one is a CD called Vision. But Souther also has another one called Illumination. For me, these are a beautiful catalyst to prayer and contemplation. Truly a major part of the soundtrack of my life journey. There is a film on Netflix called Vision. It’s the story of Hildegard, but I don’t recommend it. It’s not that good, it doesn’t have enough of her music in it, and it’s in German with subtitles. Not that I can’t handle subtitles, but I just thought you should know. On the other hand, it’s not terrible, and if you have an hour and a half to kill, go for it. According to tradition, Cecilia was a Christian woman, the daughter of a Roman senator, probably during the time that Urban I was bishop of Rome (222 – 230 CE). Her mother may have been a Christian, as it seems she was raised in the faith from a very young age. She was engaged to a pagan man named Valerianus, however she had made a personal vow of celibacy as a sign of her devotion to Christ. During the wedding, while the musicians played, she is said to have sung of her love for God alone. On the wedding night, she told her new husband that she intended to remain a virgin for Christ. Understandably disturbed by this, Valerianus demanded to see the bishop, but after meeting bishop Urban, he was converted to the faith. Valerianus then told his brother Tiburtius about Christianity, and he also converted. Cecilia, Valerianus and Tiburtius began a ministry of helping the poor of Trastevere, feeding the hungry and caring for the bodies of those who were martyred. It appears that there was also a house church meeting in their home. Eventually, the two brothers were arrested and taken to face the Urban Prefect, who condemned them to execution. However, the officer who was supposed to carry out the sentence, one Maximus, was himself converted by their conviction and their bravery, and eventually all three of the men were martyred. Cecilia had them buried in the catacombs of San Callisto, which some sources say was on land originally owned by Cecilia’s family. Before Cecilia herself was arrested, she made arrangements for the church to be able to continue to worship in her home. After her arrest and confession, she was condemned to death by suffocation. It is said that the first attempt to execute her was to suffocate her in her own private baths (like a steam room built into the house). After locking her in and turning up the heat, her would-be executioners waited for her to die. Instead, they only heard the sound of her singing coming from inside the bath. Finally they grew impatient, and the order was given for her to be beheaded. The executioner, apparently unnerved by Cecilia’s slight frame and strong faith, swung the sword three times, but was unable to finish the task. It is said that Cecilia finally bled to death, but by some accounts it took three days. Of course the number three (in both the swings of the sword and the time it took her to die) is not a coincidence – the number is meant to connect her to her Lord, the proto-martyr, who rose on the third day, as well as to the Christian understanding of God as Trinity. But we must keep in mind that although legendary details have certainly been added to the story, that does not negate the historical existence of the martyrs in question. 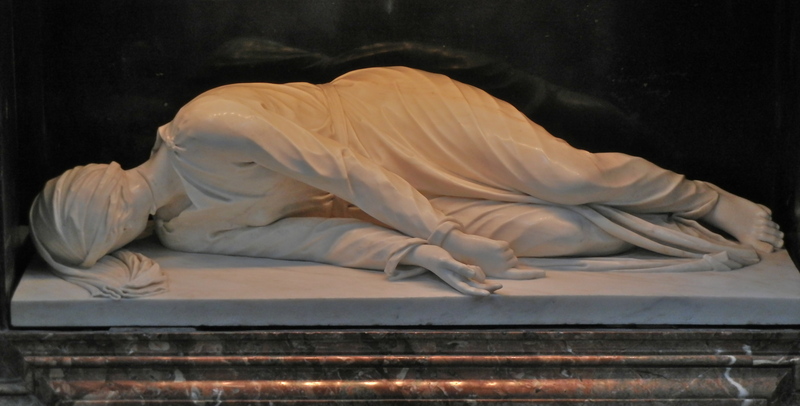 Cecilia was buried in the catacombs of San Callisto. Her feast day is November 22nd, and she is now considered the patron saint of musicians. Notice Cecilia’s fingers in the statue. Three fingers on one hand, and one finger on the other. This is to signify the Trinity: One God in Three Persons. It is said that this is exactly the way her body was found when it was exhumed. I don’t know about you, but for me there’s just something about music that can make me feel connected to God like nothing else does. I kind of hinted at this in Trinity 101, that we are hard wired to respond to the Trinity – and that music is Trinitarian – three notes make one chord; three primary chords make up a composition. You get the idea. You may have heard the expression, “Music soothes the savage beast.” The actual original quote is “Music has charms to soothe the savage breast,” – as in, the heart of a person. The quote comes from a seventeenth century play, but long before that St. Augustine said that the human heart is restless until it rests in God. Augustine is also credited with saying, “He who sings, prays twice,” but I can’t actually find that in any of his writings. The point is, music gives us peace because it connects us to God. So I hope you will check out Hildegard of Bingen, and especially Richard Souther‘s recordings, and add them to your collection of pilgrimage music. You know, this is the year I turn 50. I’m at “a point” in my life. Written some books. Recorded some CDs. Got tenure. Lost count of how many times I’ve been to Rome. I’m feeling pretty grateful, and trying to remember to count my blessings as much as possible. In fact, just today I decided I’m giving up complaining for Lent. I’ve tried this before, but it’s a work in progress. Anyway, combinging music and gratitude, here’s a little gratitude song for the occasion, my song called, “If I Could Thank You.” This YouTube video is a live version from a TV show I did a few years (and a few pounds) ago, but the new studio version of the song is also on my new CD, Still Quiet Voice. Oh God, King of saints, who strengthened your servants (the martyrs) to make a good confession, staunchly resisting, for the cause of Christ, the claims of human affection, and encouraging one another in their time of trial, grant that we who cherish their blessed memory may share their pure and steadfast faith, and win with them the palm of victory; through Jesus Christ our Lord, who lives and reigns with you and the Holy Spirit, one God, for ever and ever. Amen. This entry was tagged Cecilia, Hildegard, music, Mystics, Richard Souther. Bookmark the permalink.